All transactions are safe and secure with a reliable history in online purchasing behind each of our associates. 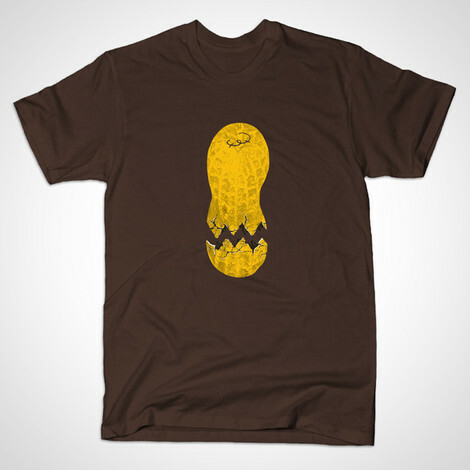 Buy the Charlie Brown Peanut t-shirt to own Peanuts clothing and merchandise. This Charlie Brown design transforms an ordinary cracked peanut into a symbolic work of art that resembles the tormented ladies man. He can't seem to shake the four ladies in his life, including Violet who snubs him, Peppermint Patty who is manlier than he is, and Lucy who plays tricks on him. Frieda, the curly haired redhead, is one of the few who genuinely cares about his feelings. If you're tormented too, try pairing this with a Costume Peanuts t-shirt. In addition to the Charlie Brown Peanut tee above, browse the Peanuts Clothing Gallery for more apparel like men's and women's clothes, kids shirts or hoodies.